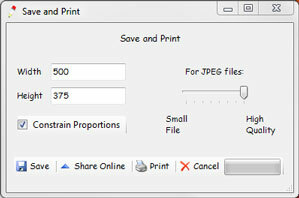 To save the final cartoon to a file, click the Save button and enter the file name (supported formats include JPEG, JPG, GIF, PNG, BMP, TIFF and SVG). Starting with version 7.0, cartoons that use the Solid (default), No Outlines or Outlines style can be saved in Scalable Vector Graphics format (SVG). It is also possible to share cartoons without saving them to your computer. In the Save window, click Share Online and your picture will be uploaded to our server (it will be scaled down if the width or height are more than 500px). This is useful if you want to share your art on Facebook or in your blog. The default size of the output image is the same as the current on-screen picture, the width and height can be changed to any values. The quality of the image is preserved at any scale up to the size of the original photo and so increasing the size does not affect quality.